The Missouri Tigers host the Tennessee Volunteers at Memorial Stadium at Faurot Field on Saturday, November 11, 2017. The opening line for this game has Missouri as 10.5 point favorites. The Tigers have an over/under record of 5-4-0 and they are 5-4-0 against the spread. The Volunteers have an ATS record of 3-6-0 while their over/under record is 3-6-0. 11/04/17 DB Baylen Buchanan Undisclosed is "?" 11/04/17 PK Brent Cimaglia Undisclosed is "?" 11/04/17 OL Brett Kendrick Undisclosed is "?" 11/04/17 OL Drew Richmond Undisclosed is "?" 11/04/17 WR Josh Smith Ankle is "?" 11/04/17 WR Latrell Williams Undisclosed is "?" 11/04/17 OL Marcus Tatum Undisclosed is "?" The Tennessee Volunteers have run for 1,172 yards as a team, which ranks 100th in college football. They've run 321 times, averaging 3.7 yards per carry as a rushing unit. The Volunteers have been penalized on offense 53 times for 408 yards so far this season, which has them 75th in the country in penalties. They are 110th in the nation in points scored with 187. They have run 561 plays this season for 2,685 yards, which ranks them 109th in Division 1 in total offense. The Volunteers average 4.8 yards per play, which is 121st in college football. As a team they have accumulated a total of 155 1st downs this year, placing them 114th overall as an offensive unit. Jarrett Guarantano averages 6.1 yards per pass attempt and 5.9 adjusted yards per throw. He has completed 59 passes on 94 attempts for a completion percentage of 62.8%. His quarterback rating this year is 115.5. He has thrown for 575 yards this season. The Volunteers rush defense has allowed 416 attempts for 2,136 yards this year, putting them in 122nd place in D-1 against the run. Tennessee has committed 63 penalties for 507 yards on the defensive side of the ball this season. That ranks them 71st in college football. They are 57th in the nation in points allowed on defense with 227. They have surrendered a total of 3,486 yards on D, which is 59th in the country. The Volunteers are ranked 67th in yards per play allowed with 5.6. Opposing offenses have completed 109 passes on 203 attempts against the Tennessee Volunteers defense this season, placing them 6th and 3rd in Division 1. The Tennessee pass defense has also given up a total of 1,350 yards through the air, which is 4th overall in total pass defense. The Tennessee Volunteers have attempted 17 field goals this season and made 11, which is 58th in D-1. Their kickers have a field goal percentage of 65%. Tennessee Volunteers kickers have made 100% of their extra points, going 22 for 22 this year. Their punters have totaled 2,603 yards on 56 punts, averaging 47 yards per punt. That places them 5th in Division 1 in punting average. Tennessee is ranked 92nd in the nation in punt returns with 11. They've accumulated 117 punt return yards and average 10.6 yards per return, which is 31st in college football. They have returned 20 kicks for 481 yards on special teams, ranking 72nd in kick return yardage. The Volunteers average 24 yards per kick return and they are 122nd in the country in all-purpose yards with 3,282. The Tigers are 24th in the country in points scored with 329. They have run 598 plays this year for 4,357 yards, which ranks them 14th in Division 1 in total offense. The Missouri Tigers average 7.3 yards per play, which is 5th in the nation. As a team they have accumulated a total of 209 1st downs this season, ranking them 28th overall as an offensive unit. On the ground Missouri has run for 1,523 yards as a unit, which ranks 58th in college football. They've run 299 times, averaging 5.1 yards per rush as a unit. Missouri has been penalized on offense 59 times for 495 yards so far this year, which has them 50th in the country in penalties. 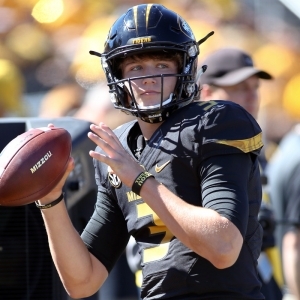 Drew Lock has passed for 2,795 yards this year. He's completed 176 throws while attempting 290 passes for a completion percentage of 60.7%. His quarterback rating this season is 170.7. He averages 10.4 adjusted yards per throw and 9.6 yards per pass attempt. Missouri is 107th in the country in points surrendered on defense with 302. They have given up a total of 3,973 yards on D, which is 102nd in D-1. The Tigers are 83rd in yards per play allowed with 5.8. Opponent offenses have completed 188 throws on 298 attempts against the Missouri defense this season, ranking them 106th and 93rd in the nation. The Missouri Tigers pass defense has also surrendered a total of 2,341 yards in the air, which is 104th overall in total pass defense. Their rushing defense has given up 385 attempts for 1,632 yards this season, putting them in 84th place in the country against the run. The Tigers have had 52 penalties for 409 yards on defense this year. That places them 39th in college football. Missouri is 78th in the country in punt returns with 12. They've totaled 142 punt return yards and average 11.8 yards per return, which is 27th in D-1. They have returned 25 kicks for 572 yards on special teams, which puts them 45th in kick return yardage. The Missouri Tigers average 23 yards per kick return and they are 13th in the nation in all-purpose yards with 5,072. The Tigers have tried 13 field goals this year and made 10, which is 68th in college football. Their kickers have a field goal percentage of 77%. Missouri kickers have made 95% of their extra points, going 41 for 43 this season. Their punters have accumulated 1,687 yards on 37 punts, averaging 46 yards per punt. That ranks them 8th in the NCAA in punting average. Who will win tonight's Volunteers/Tigers college football game against the spread?